Two Bognor loanees returned to Pompey to be involved in Tuesday’s 3-2 victory over Tottenham Hotspur under-21s in the Checkatrade Trophy. 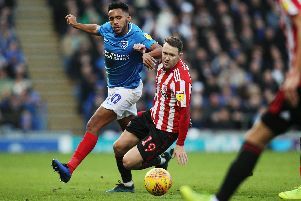 Bradley Lethbridge was handed his Blues bow, featuring for 65 minutes at Fratton Park, while Dan Smith was an unused substitute. Yet the Rocks were bolstered by a different pair of upcoming Fratton Park talents for their Bostic League premier division clash against Corinthian Casuals. Second-year scholars Leon Maloney and Freddie Read featured for Jack Pearce’s side at Nyewood Lane. The pair enjoyed their first taste of senior football, having impressed for Pompey Academy this season. Both caught the eye for Bognor in their 1-0 defeat. Southsea midfielder Read was awarded man of the match, while Isle of Wight talent Maloney conjured up several decent goalscoring opportunities. Pompey Academy chief Mark Kelly feels the duo are ready for the challenges of senior football. And he feels exposing Read and Maloney to that environment will enhance their development. Kelly said: ‘It’s the challenge for them, playing senior football for three points. ‘Don’t get me wrong, it’s competitive enough and we try to play for three points. ‘But for them to be exposed to that senior competitiveness and speed of the game is good. ‘Freddie got man of the match on Tuesday night and Leon got on the outside quite a few times, drove and delivered some good balls into good areas. ‘So it’s a little challenge for them and where they are. Read and Maloney’s switch to Nyewood Lane continues the ongoing partnership between Pompey and Bognor. In total, five players – Lethbridge, Smith, Read, Maloney and Joe Dandy – have represented Pearce’s side this term. The two latest recruits have arrived at Nyewood Lane on an ad hoc basis. Kelly will assess when they will feature for the Rocks and for the academy. He added: ‘It’s an ad hoc basis. It was one of those nights where it was an opportunity for them to play a game.